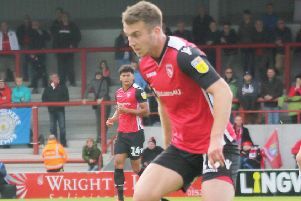 The full-back meets his former employers at the Globe Arena, seven days on from his first goal for the club at Macclesfield Town last weekend. Mills is out of contract at the Globe Arena in the summer and it wouldn’t be a surprise if he had caught the attention of other clubs. Watch as Bentley discusses the defender’s displays over the course of the season and the chances of keeping him at the club for longer.